MACS® GMP Fluorescent Antibodies have been developed for GMP-compliant cell labeling. Possible applications include flow cytometry analysis and subsequent flow sorting of cell populations from heterogeneous human blood products within a GMP manufacturing environment. 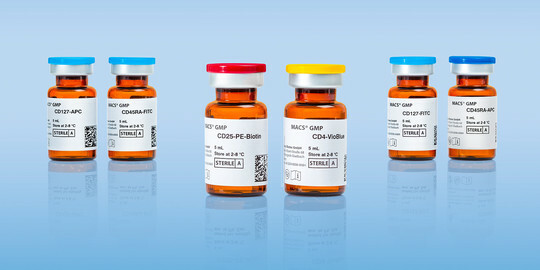 Download the informational brochure to find out more about our MACS GMP Fluorescent Antibody portfolio and the featured application: GMP-compliant cell labeling of naive regulatory T cells.